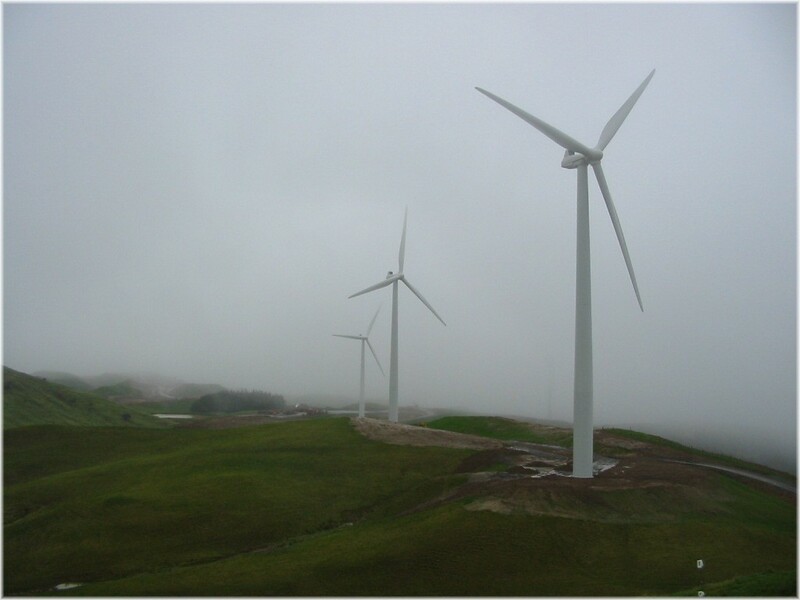 One of the topics I have been researching for my book documenting the environmental history of the Manawatu Region (see: Manawatu’s environmental past to be documented) are wind farms. This is a fascinating story, not so much because of the wind farms themselves, but in terms of the clear evolution in thinking around wind farms. The contrast between the public response to the early wind farms in the Manawatu and the later ones could not be more dramatic. Wind farms appeared on the Manawatu landscape just before the turn of the new millennium, when the first stage of the Tararua Wind Farm was approved to be built on the northern Tararua Ranges, just south of the spectacular Manawatu Gorge. This location was far from arbitrary; it was built to take advantage of the funneling effect of the Gorge on the predominant westerly winds that characterize all of New Zealand, called the “Roaring Forties“. The Te Apiti wind farm was proposed a few years later, in 2003. This was to be sited on the opposite side of the Gorge, in the southern Ruahine Ranges. These turbines were significantly bigger than their Tararua cousins, with a blade length of 35 metres and a tower height of 70 metres, giving them a maximum standing height of more than 100 metres. Nevertheless, what was striking about both these early proposals was the very muted reaction. The resource consent applications attracted only a limited number of responses, fairly evenly balanced between those in support and those opposed. Obvious points of support were for the “clean” energy benefits of wind generation and the economic benefits, particularly to the local economy. Some even thought the turbines would add interest to an otherwise rather homogenous agrarian landscape! However, this was all to change with the Te Rere Hau proposal two years later, when the weight of opinion was to turn against wind farms in the Manawatu. Since being built from 2006, this wind farm has attracted noise complaints on an almost daily basis and has been subject of ongoing court proceedings because of the noise it generates. But even Te Rere Hau paled by comparison to the proposed Turitea Wind Farm, which was contentious even before it reached resource consent application stage. This proposal attracted 700 submissions, around 60 per cent in opposition. This proposal was particularly contentious owing to the proximity of the proposed site to a large population base (Palmerston North City) and because part of the site was in a bush reserve, set aside in 1889 for the town’s water supply, and representing one of the last remaining examples of forest of this type. The fall-out from the proposal had a divisive and destructive impact on the community; it divided the community into those who stood to gain and those who stood to lose, pitting neighbours against neighbours. Conspiracy theories, rumours and retribution ran rife. Eventually, the proposal was consented but with only a portion of the turbines sought approved. This, along with changing economic circumstances, brought the viability of the project into doubt. It is possible that it will never be built. One thing is for sure, however, people could not be more divided in their opinions on wind farms. Some enjoy the interest they bring to the landscape. My husband and I lived for a time in Ashhurst, within clear sight of the Te Apiti wind farm, and we found the turbines quite restful and mesmerizing – rather like big kinetic sculptures to be enjoyed from the comfort of our living room. However, we would have never admitted that to our fellow residents, some of who were certain that the turbines affected their sleep and had a detrimental impact on their health. Others sit somewhere in the middle of the debate, and while relatively supportive at first, now feel that “enough is enough”, and that the proliferation of different size and design turbines on the Tararua and Ruahine Ranges has led to a displeasing “visual dissonance”. The development of wind farms in the Manawatu has brought into focus a number of issues, including how decision-makers should deal with “cumulative effects”, particularly of other wind farms that have been proposed but not built. Also, whether it is appropriate to include an existing wind farm in the “baseline” against which to assess effects of a new proposal, or whether this is – for those opposing a proposal – a bit like double jeopardy. It is certainly an interesting topic – in my view, more for what it tells us about ourselves, than the ins and outs of the wind farms themselves (though many an engineer would disagree with me here I am sure!). Next Article What’s in a title? Your ideas please! Thank you for this interesting account! “..restful and mesmerizing” is a good description for me too. And while I’m not sure if my thorough approval of their purpose is taking over here, but I find them visually beautiful as well. While, I would agree that noise pollution and access issues have to be taken into account in the original planning for the sake of those living nearby, I have to wonder about the extent to which those who object on other grounds, care about the environment we will leave our grandchildren if we don’t make changes. You’ve been blog busy lately, time must be weighing on your hands. I used wind farm landscape impact assessments from Australian and English countrysides as part of a cultural assessment of a proposed bridge project in a Yukon historic community. Interesting to see what metrics – most of which you touched upon – have developed in coming to to grips with industrial additions to landscape. Interesting piece you’re working on. Thank you David for your comments. Wind farm developments in NZ have slowed down lately, but like many things, this is more related to economic conditions (which tip the balance in terms of their viability) rather than environmental ones (like a growing intolerance towards wind farms) – though certainly, my research in the Manawatu has found that people are much more aware of issues relating to wind farms, and are becoming more knowledgeable and savvy. Having said all that, the Manawatu is one place where the widespread view is that the landscape has reached saturation point, and there would be significant resistance to further proposals. And no, time is not something I have a lot of – but I have been feeling that I have neglected the blogging of late to work on the book, and I am just attempting to compensate! Plus its really invigorating getting the views of others on these topics, especially after working alone on the project for so long. There’s an update on the Turitea fraud here.